When visitors flock to some of America’s most iconic historic venues this July 4th weekend, they’ll learn much about our nation’s history but also have the opportunity debunk the many legends and myths about When visitors flock to some of America’s most iconic historic venues this July 4th weekend, they’ll learn much about our nation’s history but also have the opportunity debunk the many legends and myths about chocolate. Did you know that cacao beans were used as form of currency dating back to the Aztec Empire, Christopher Columbus discovered America AND chocolate, bringing cacao beans back to the Spanish court in the early 1500s, George Washington drank “chocolate cream” at breakfast, Benjamin Franklin sold chocolate in his print shop, or chocolate has traditionally been included in military provisions throughout history? Mars Chocolate North America has partnered with sites such as Bent’s Old Fort National Historic Site, Fort Ticonderoga, Colonial Williamsburg, Mount Vernon, The National Archives, Monticello, The Smithsonian, and Parks Canada to not only sell AMERICAN HERITAGE® Chocolate, fashioned off ingredient lists from the 1750’s, but also to educate consumers on the history of the Americas through the unique lens of chocolate. Some of the aforementioned venues including The Smithsonian, The National Archives, and Old North Church will introduce a new Spiced and Iced Chocolate drink from AMERICAN HERITAGE® Chocolate as well as offer free drink samples, chats with AHC’s Chocolate Historian and 18th century-inspired chocolate-making demonstrations. 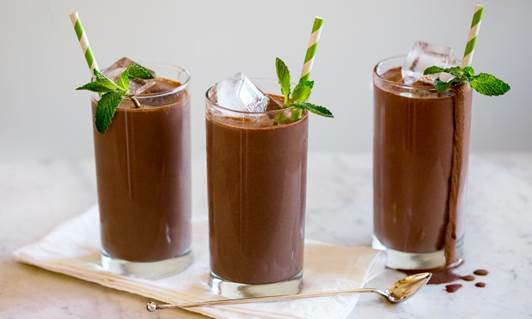 To try the drink and other decadent chocolate recipes at home, read on and happy Fourth of July! · Heat water until gently boiling, then remove water from heat. · Whisk remaining ingredients slowly into water. Continue whisking until chocolate is dissolved and smooth. · To serve, either: Dispense hot liquid over crushed ice, or; Pour into container and chill overnight. Baking is all about gathering together. So why not whip up a batch of brownies to share? 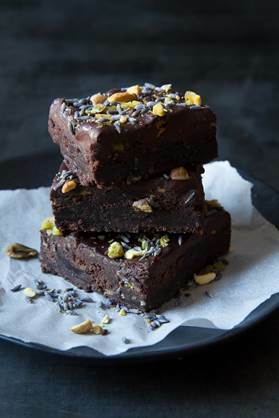 Want to show a little extra appreciation, AMERICAN HERITAGE® Chocolate has developed a stunner – lavender pistachio brownies made with our tasty chocolate chunks. So good! 1, Follow the directions on the box of your desired brownie mix. 2. Add chopped chocolate, lavender and pistachios to brownie batter. 3. Pour brownie batter into baking pan and bake as directed. Brownies are done when a toothpick inserted comes out clean. Optional: Top with additional chopped lavender and pistachios. · Whisk ½ cup milk with cornstarch to dissolve, set aside. · In a saucepan, whisk remaining milk with heavy cream, sugar, cocoa powder, espresso and salt until blended. Heat the mixture until just before a simmer. Remove some of the hot milk mixture with dissolved cornstarch, blending together. Pour the cornstarch mixture into the saucepan and continue cooking until mixture slightly thickens. 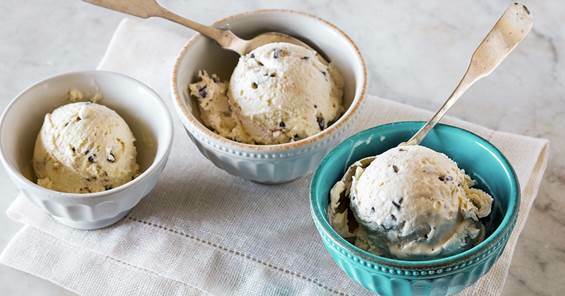 Remove from heat, stir in American Heritage Chocolate® Drink and vanilla. 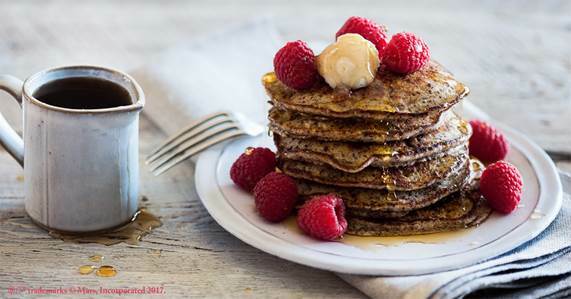 · Whisk egg yolks with ricotta cheese, milk, sugar and salt. Fold in the flour and chocolate. Set aside. · In a separate bowl, whip egg whites to soft peak. Fold whites into ricotta mixture. · Melt butter as needed in a large skillet. Ladle batter, 1/4 cup per pancake. When edges brown and pancake bubbles, flip over and continue cooking until firm. *AMERICAN HERITAGE® Chocolate is an authentic historic chocolate made from ingredients available in the 18th Century. The recipe repre­sents a true taste of chocolate the way our ancestors would have enjoyed it. Made with all-natural ingredients and no preservatives, AMERICAN HERITAGE® Chocolate comes in four unique formats: chocolate sticks, chocolate bites, chocolate baking/grating blocks, and finely grated chocolate drink mix. What do you have planned for the holiday and what special recipes will you be making? Let me know in the comments, I love hearing from you! I’m intrigued by Heritage Chocolate and wonder how it will taste differently from regular chocolate. Thank you! Thank you! Awesome recipes! We will BBQ & of course fireworks! We’re making Firework Cupcakes.